For women with long and/or irregular menstrual cycles, the path to pregnancy can be especially difficult, as such cycles make ovulation prediction challenging, and also reduce the number of chances each year that a woman has to conceive. 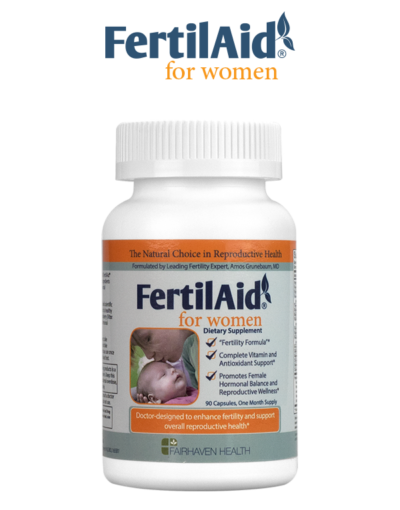 FertilAid for Women, an all-natural dietary supplement offering full prenatal vitamin support and a proprietary blend of fertility-enhancing ingredients, is regarded by many women with irregular cycles as an effective method for restoring hormonal balance and cycle regularity. Typically, the evidence of cycle improvement is measured simply by observing the resultant change in cycle length after supplementing with FertilAid. 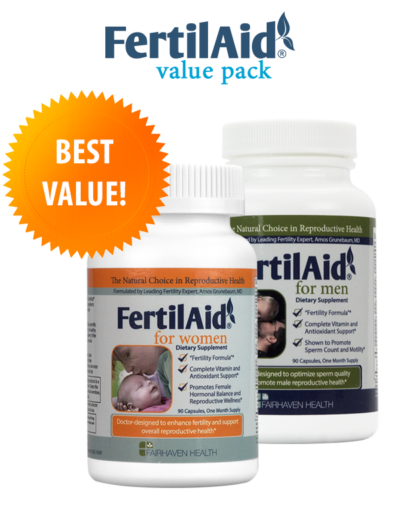 For example, if a woman’s cycle ranged from 40 – 60 days prior to taking FertilAid, and changed to a steady 30 day cycle after taking FertilAid, she might conclude that FertilAid had helped to “normalize” her cycle in a manner beneficial for achieving pregnancy. In many cases, this change in cycle length is the only proof that we have that FertilAid for Women is working to restore hormonal balance. However, with the help of the OvaCue Fertility Monitor, we have the opportunity to obtain even more detailed insight into the hormonal underpinnings of the way in which FertilAid works. Here is one such real life case. “Jane” (not her real name) is 31 years old, and has been trying to conceive for over 8 years. She has been diagnosed with Stage 2 endometriosis, and has tried Clomid and acupuncture in her quest to become pregnant. In addition, Jane has undergone 3 failed rounds of IUI. 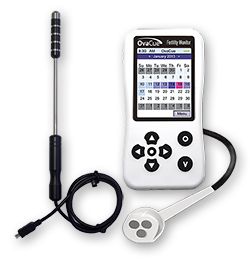 Jane began using the OvaCue in December of 2011 to help her determine when she ovulates. 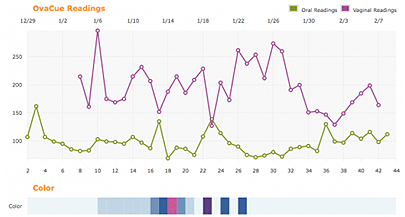 Here is a graph of her first OvaCue chart, prior to taking FertilAid. 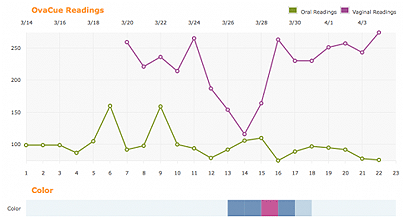 As you can see, there were lots of ups and downs – multiple oral ‘cue peaks’ and vaginal rises, followed by vaginal declines, which makes interpretation of her OvaCue data exceedingly difficult. In short, her OvaCue chart for this cycle is characteristic of a person experiencing a considerable degree of hormonal imbalance and cycle irregularity. In an attempt to impart some regularity to her cycle, Jane began taking FertilAid for Women. As you can see in her chart below, after three months of taking FertilAid, her OvaCue chart looks radically different, and in fact, now conforms to what we would regard as a “textbook” cycle. Jane’s vaginal readings start out elevated, and then we see a very clear downward trend in vaginal readings from CD 12-14 (a clear indication that estrogen levels are building in preparation for ovulation), with CD 14 as her lowest vaginal reading yet. Then, her vaginal readings begin to rise, which indicates that estrogen levels are dropping and progesterone levels are increasing. In response to the rise in vaginal readings between CD 14 and CD 15 (again, indicating that progesterone dominance is taking hold), the OvaCue confirmed ovulation with the pink box. Once ovulation was confirmed, Jane’s vaginal readings continued to rise and remained elevated throughout the luteal phase of her cycle, suggesting that progesterone production remained steady in the second half of her cycle. In summary, the graph of Jane’s OvaCue readings clearly display the manner in which FertilAid has helped restore her hormonal balance. Her vaginal readings show the trends we look for to indicate that estrogen and progesterone are in the appropriate balance at each stage of her menstrual cycle, and these readings also reveal that she ovulated on CD 15, rather than on CD 24 as she had in her pre-FertilAid cycle. 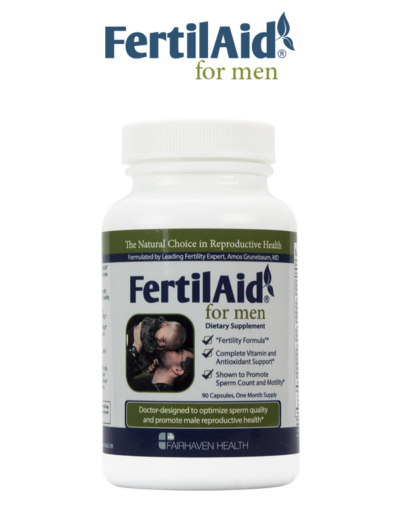 Again, a shorter, more predictable (“regular”) cycle suggests that FertilAid is restoring hormonal balance.